HP expanded its portfolio of products for professional and advanced amateur photographers with a new professional photo printer and an exclusively formulated line of HP Vivera pigment inks. The HP Photosmart Pro B9180 Professional Photo Printer brings superior image quality and flexibility to the professional photography market. Based on HP's scalable printing technology, the printer delivers increased speeds - producing a 4 x 6-inch print in as fast as 10 seconds - as well as photo permanence of more than 200 years. HP Vivera pigment-based inks offer professional photographers more choice when using a broad array of media beyond traditional photo paper. HP Vivera pigment ink technology - HP Vivera pigment ink technology, combined with the printer’s professional colors, enables accurate and consistent color reproduction. HP’s third-generation gray ink is more neutral than ever before, allowing for exceptionally smooth transitions and detail. 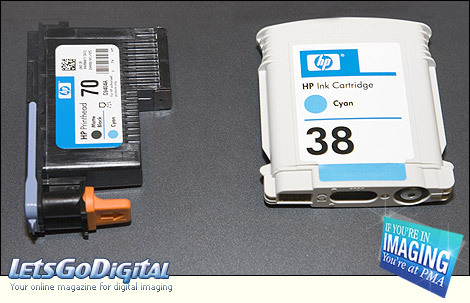 Eight individual high-capacity ink cartridges enable high-volume printing with efficient printing speeds - producing 4 x 6- inch photos in as fast as 10 seconds and 13 x 19-inch photos as fast as 1.5 minutes - ideal for professional photographers and advanced amateurs. Furthermore, users can print exceptional photos on digital fine art media including canvas, photo rag, watercolor, stiff pre-matte and film up to 1.5-mm thick, as well as improved HP Advanced Photo Paper. The estimated US street price of the HP Photosmart Pro B9180 printer is $699. 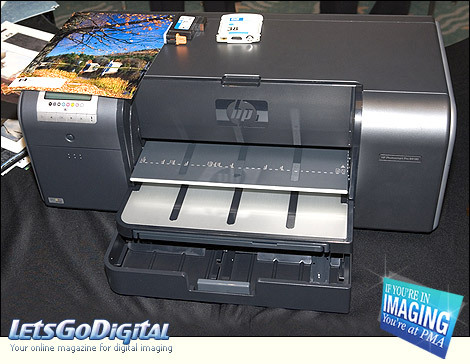 The printer is expected to be available for purchase in May/June 2006 in North America. - Dimensions (WxDxH) : 26.6" x 16.9" x 9.2"
HP Digital Fine Art Papers - HP also introduced a variety of new media, including: four digital fine art papers that are ideal for reproductions and photographs; HP Advanced Photo Paper that is thicker, dries instantly and exhibits excellent water-resistance; the world's glossiest CD/DVD labels; and a self-adhesive photo paper that makes it easy for consumers to place photos in albums and creative projects.